China’s changing its stance on alliances with foreign universities could have significant repercussions on U.S., U.K., and Australian business schools. In a six-line statement from China’s ministry of education, the country’s universities were asked to “purge their links with foreign institutions,” which effectively shuttered 234 joint degrees and partnerships, including 24 undergraduate and master’s qualifications in business administration and finance. 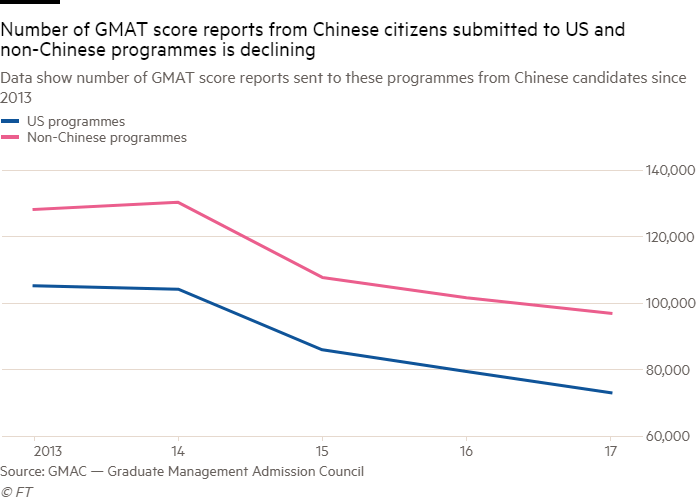 As part of this effort, Chinese universities have also increased their recruiting efforts in an attempt to lure students away from foreign programs by offering more fast-track options and incentives. What could this mean for foreign schools? For starters, they can expect fewer applications from Chinese citizens. Since 2014, the demand has already decreased from 130,000 GMAT test submissions to 97,000. Read the full report in the Financial Times.